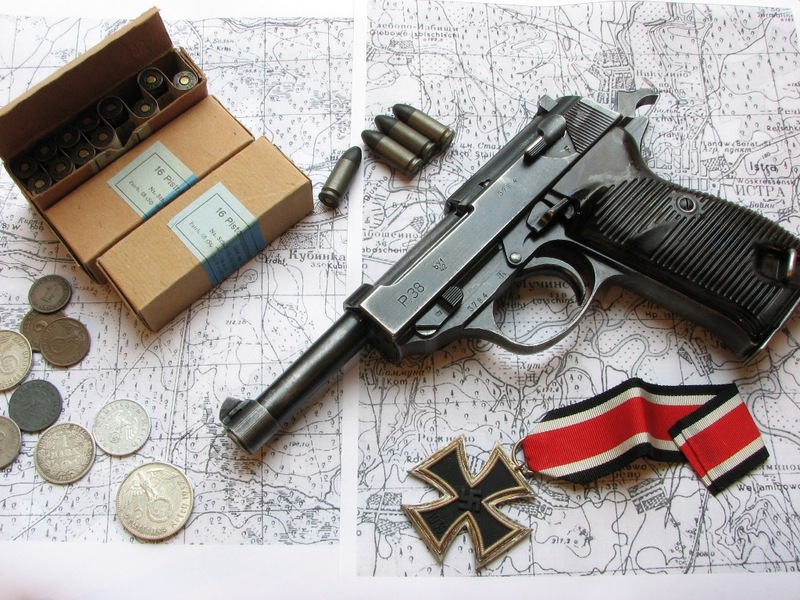 Information, photos, references, and trivia on the WW2 Walther P.38 and post-war P38 pistol. If you wish to link to this page, please link only to the main page, not sub-pages or documents. Please do not rip off my PDF files or pictures for your own site. Thanks. Two more "BTH12" pistols have been reported. See "BTH12" under "Pistols"
Added "When was my post-war pistol made?" to "Information"
Added another late date AC frame pistol to "Pistols"
Added some late war pistols to "Pistols"
Post-war parts gun, two guns in .30 Luger, and a high-polish gun. P38 surplus, P1 surplus, P38 commercial, and P4 surplus guns. Consecutive serial number SVW-45s. Consecutive serial number SVW-46s. Post-war P38 in 7.65mm Parabellum. East German P.38s. Reworked wartime ac40, ac44, and an East German manufactured gun. Steel frame P38 from Earl's Repair Service. Post-war P.38 in 5.6mm (.22 LR). A Zero series and "a" prefix Spreewerk reworked for use in post-war East Germany. The Czechoslovakian Vz46. byf44 police issue with British markings. Commemorative "100 Jahre" P38 marking the 100th year anniversary of Walther. Unknown BTH12 marking on several P.38s. Norwegian military surplus P38. Mixmaster P.38 with WW2 German, East German, Czech, and British markings. The ultra-rare "ac no-date" - and how to spot a fake. Some things you can do to a P.38. Please don't! French Mausers 1945 to 1946. Gotterdammerung - some pistols from the last months of the war. Another version of the late date AC frame pistol. An excellent article by Peter Kokalis on the wartime P.38 pistol can be found here, and another article on the post-war P38 here. My post-war pistol has no date or date code - about when was it manufactured? You can get a rough estimate based upon these observed pistols. Need to replace a broken WW2 slide part with a post-war part, and don't know if the new part will fit? Read the slide part compatibility guide. Note: this information is intended as a guide only. I am not a gunsmith. If you do not have working knowledge of the P.38 pistol, consult a competent gunsmith before attempting to effect repairs to your P.38. Over the long term, will oil cause bakelite grips to deteriorate? An attempt to find out starts here. And continues after one year... and finally ends at three plus years. Atarian's quick reference magazine guide. Helps to identify which magazine is correct for your pistol. Atarian's post-war reproduction and aftermarket grip guide. Some of the currently available non-World War II grips for the P.38. Can a "dipped" pistol be "un-dipped?" The answer is yes, and quite successfully. Take a look at zero series cyq serial number 030. What's that 13 digit number on my pistol and/or magazine? P38 Owner's Manual (multilingual - 4.8 MB). P38 Owner's Manual v2 (multilingual - 6.2 MB). P38 Operating Instructions (multilingual - 1.2 MB, source: Walther Germany). P38 Owner's Manual (1 MB, source: Interarms(?)). P38 Owner's Manual (edited for clarity - Thanks to Quentin for providing this). German military drawings of the 9mm Patrone: page 1, page 2, page 3, and page 4. P.38 manual from 1940 (German) - Thanks to Johan and Ron Clarin for providing this. P.38 illustrated parts breakdown (German - 95KB, source: Walther Germany). Explanation of the markings on a post-war P38/P1 (source: Federal Foreign Office – Division 241, Germany). Test your P.38 knowledge with the P.38 quiz! 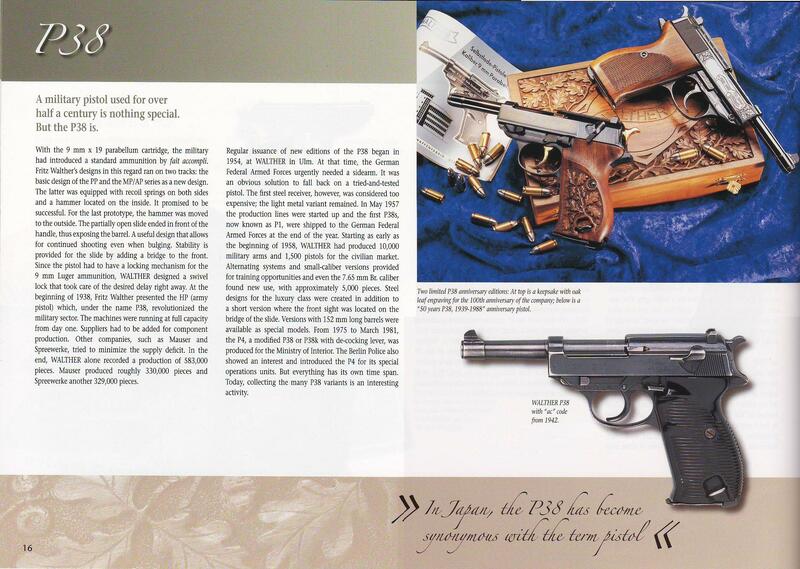 Information on the P.38 from the 2008 Walther catalog. The Defense Intelligence Agency's Small Caliber Ammunition Identification Guide. German ammunition section (213kb) or the entire document (10.1Mb). Small arms section of the Handbook on German Military Forces. P.38 converted to .45 ACP. 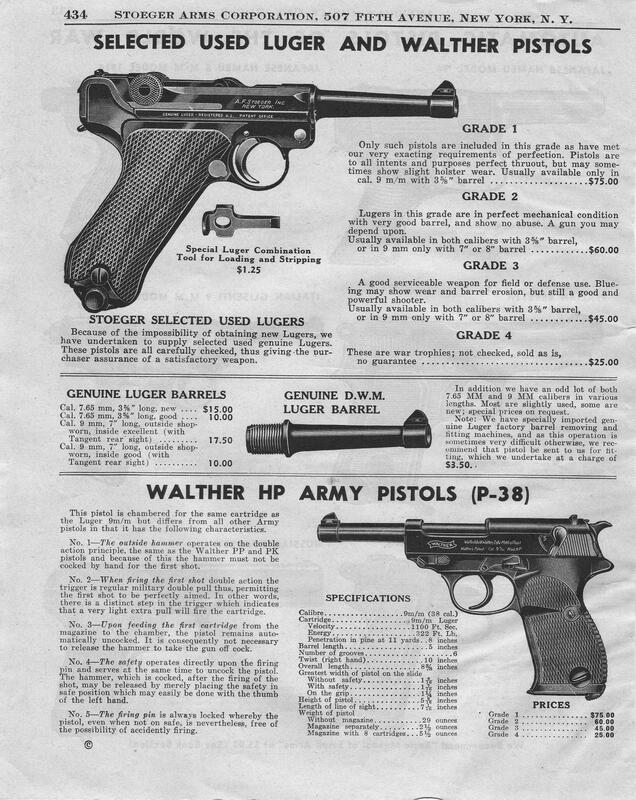 1964 Luger parts list and prices. 1964 P38 parts list and prices. Pricing of Stoeger's Mod HPs and Lugers (1948). Stoeger's guide to World War II pistols circa 1948 (page 1, page 2). A baker's dozen of Walther post-war slide legend variations (this is far from all-inclusive). Here's what a P.38 frame looks like before the machining process begins. Is Walther still making the P.38? Information Exchange Pursuant to the OSCE Document on Small Arms and Light Weapons 2003, 2008, 2010. Note in 2002 the United States was by far the largest importer of German "Revolvers and Self-Loading Pistols" with 1,040,985 imported (of 1,082,797 - the balance of 41,812 or about 4% going to 20 other countries), while the Germans destroyed only 5,666 "surplus" pistols. In 2009 the US imported none and 17,520 surplus pistols were destroyed (none were exported to any country). See Annexes 2 and 3. Fritz Walther's "automatic pistol," patent number 2135992 dated November 8, 1938 (English). Fritz Walther's "automatic firearm," patent number 2145328 dated January 31, 1939 (English). Walther pistol patents 1926 to 1942 (German). Interarms was a long-time importer of products from Walther and many other manufacturers. Browse some of their catalogs here. 1989 Interarms catalog. Walther pistols and target rifles, Rossi, Astra, bolt action rifles and barreled receivers, and more. 5" by 7" catalog. 1976 Interarms catalog. Walther & Mauser pistols, revolvers, bolt-action rifles, ammunition, optics and accessories. 8.5" by 11" catalog. 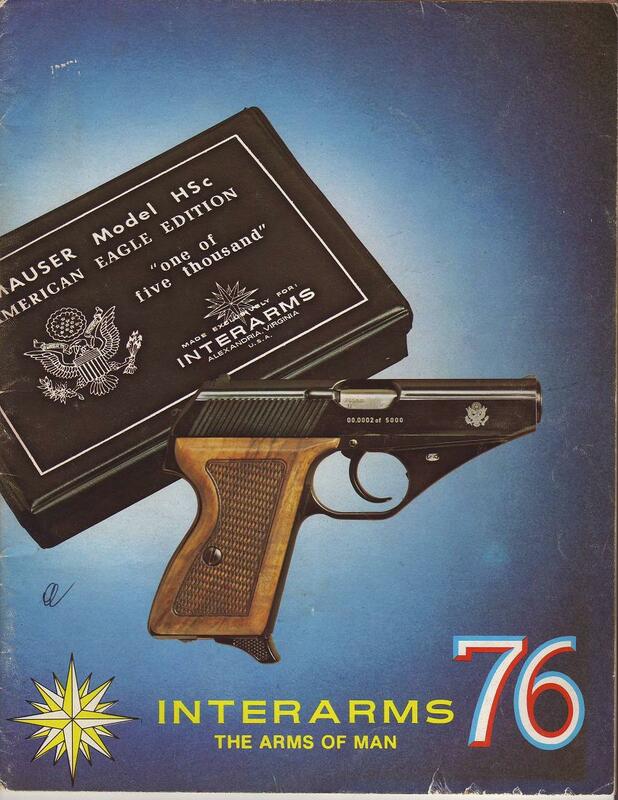 The 1979 Interarms catalog features one of the last Mauser offerings, the HSc American Eagle, and the Parabellum. Complete line of Walther pistols plus revolvers, long guns from Walther and others, revolvers, and more. 8.5" by 11" catalog. The 1983 Interarms catalog features the Mauser cartridge counter Luger, Walther pistols and target rifles, SIG, Star, and Astra pistols, rifles, dragoons, and SVW45 & SVW46 P.38s. 8.5" by 11" catalog. 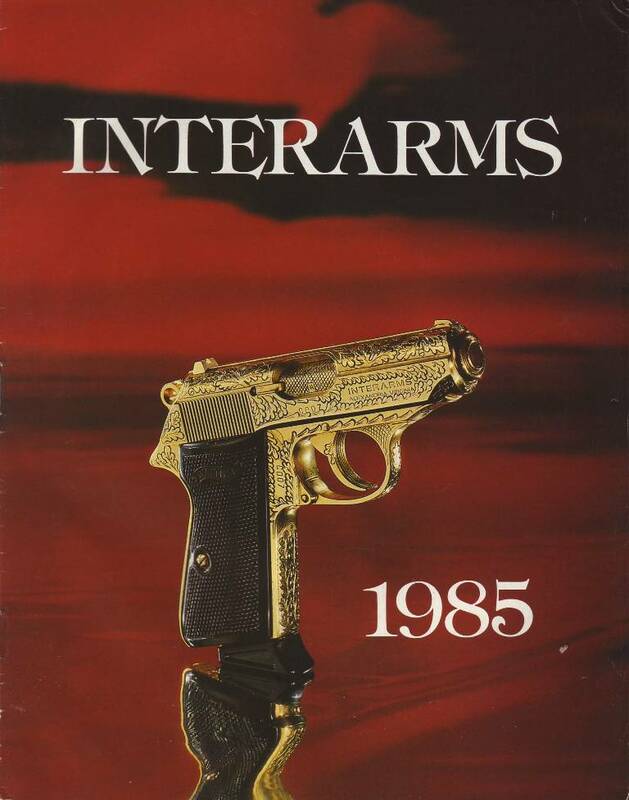 1985 Interarms catalog featuring Walther presentation pistols, Walther target rifles and pistols, Astra, Star and SIG-Sauer pistols, the Steyr AUG rifle, etc. 8.5" by 11" catalog. 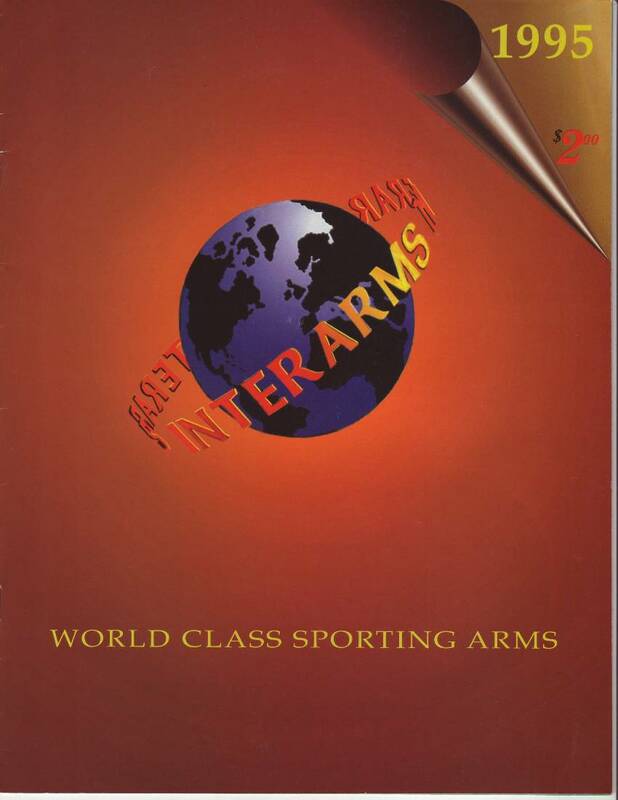 1995 Interarms catalog. Walther PP series, P38, TPH, and P5. Also Star, Rossi, No. 3 Enfields, and Norinco. 8.5" x 11" catalog. Only YOU can keep it alive!